Occupy Wall St – Who Are They and How Many Supporters They Have? Occupy Wall Street, also known as OWS, is a leaderless resistance movement. It includes people of many genders, colors and political point of views. This movement began on September 17, 2011 in Zuccotti Park. If you are fond of browsing your computer, you have probably read that there are several facts and perceptions about the people who continue to support this movement. Some say that most of their supporters are unemployed while others claim that some of them are full-time workers. There are also some people who keep on comparing the ethnicity of one supporter to another. Since there are various people who are curious about this movement, experts conduct a study about their movements. The given survey has 5,006 respondents. Most of the Occupy Wall Street supporters are white with 81.2%. Most of them are college graduates, self-proclaimed independents and males. These supporters are also employed, either full or part-time job. According to their studies, the distribution of both income and age is almost constant. However, the highest percentage of respondents comes from the age of 25 and 44. Based on the given chart, Republicans were under-presented. Only about a quarter of respondents in the study say that they were Democrats, and 30.1% make over $50,000 every year. When it comes to income, there were 46.5% who have an annual income of $25,000 and 23.3% for $25,000 annually. In addition, 29.4% have a grad school or higher education. Other stats also state that there were 12.3% unemployed, 19.0% part-time and 47% full time employees. The chart also denotes that most of their supporters are male with a percentage of 61%. Female supporters have a percentage of 35.7. 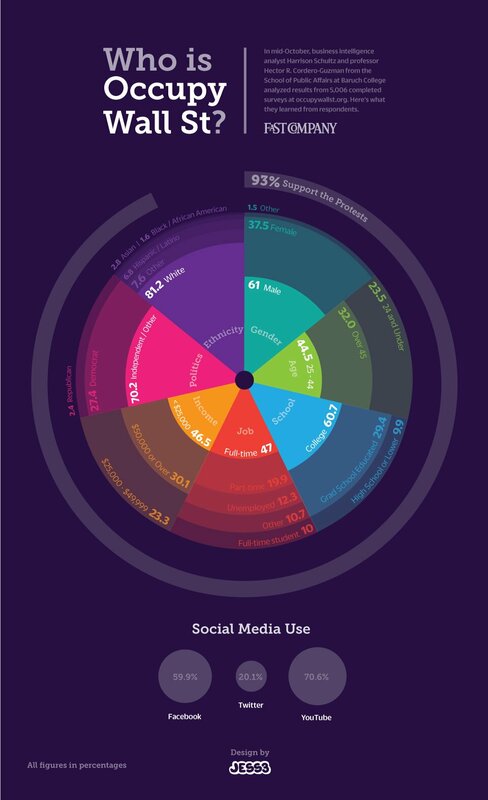 The survey use different social media connections, 59.9% Facebook, 20.1% Twitter and 70.6% for YouTube. Since the data used in this survey comes in various sources, experts are certain that they got the right figures and show the right demographics of the OWS supporters. This chart, along with the interviews and surveys, done at the actual Occupy Wall Street camps provide a strong idea about the movement. As a whole, 93% of the respondents or visitors support the protests of Occupy Wall Street. Upon checking its chart, you can easily determine the exact percentage of each respondent. With this survey, most people are aware with the actual demographics of the movement. They also don’t have to assume about the different ages, educational attainment and ethnicity of the supporters. To know more about Occupy Wall Street, you are free to check its chart and analyze it. With an extensive study of two Schultz and Guzman, you can say that their surveys are accurate.